This article is about the park in Los Angeles. For the neighborhood with the same name, see Exposition Park (Los Angeles neighborhood). 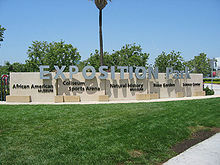 Exposition Park is situated in the south region of Los Angeles, California, in a rectangle bounded by Exposition Boulevard to the north, South Figueroa Street to the east, Martin Luther King Jr. Boulevard to the south and Menlo Avenue to the west. It is directly south of the main campus of the University of Southern California. The park is public open space, managed by the California Natural Resources Agency. The cultural facilities mentioned above are operated by both the state and Los Angeles County. The 160-acre (0.65 km2) site served as an agricultural fairground from 1872 to 1910 (hence its original name, "Agricultural Park"). In 1880, John Edward, Ozro W. Childs, and former California Governor John G. Downey persuaded the State of California to purchase 160 acres (0.65 km2) in Los Angeles to foster agriculture in the Southland. Farmers sold their harvest and arces on the grounds, while horses, dogs, and even camels competed on a racetrack where a rose garden now sits and blooms. In 1909, a group of civic-minded individuals led by former Pasadena Mayor Horace Dobbins set about reforming the park, removing the racetrack and other activities and replacing them with gardens and museums. Along the northern edge of the park, the Metro Expo Line light rail line serves the park with its Expo Park/USC Station. On the northeast, (Flower Street and 37th Street), the Metro Silver Line bus rapid transit serves Exposition Park & USC at its 37th Street/USC Station on the Harbor Transitway. The Silver Line station is located on the freeway median level of the 1-110 freeway. Exposition Park is a community located in South Los Angeles with a various amount of crime. According to the L.A. Department of City Planning, the population in 2008 was about 33,400 people. Ethnicities in this neighborhood are mostly African American and Latinos. About 56% are Latino and 38% African American. The remaining percentages are 2.2% white, 1.6% Asian and 2% other. The average age in Exposition Park is around 26 years old. University of Southern California is also located in Exposition Park. 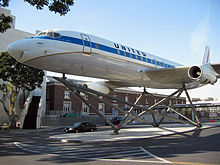 South of the campus is an assortment of museums, including the California African American Museum, The California Science Center, Exposition Park Rose Garden, The Los Angeles Memorial Coliseum, and the Natural History Museum of Los Angeles County. All of this corresponds to the violence and crime that occurs near and in Exposition Park. In the last several decades the crime rate has decreased tremendously. In 1995 the reported violent crime rate in Los Angeles County was 1,437 and in 2016 the rate was 553 total violent crimes. Exposition Park is ruled number 16 in the most violent crimes in the Los Angeles County out of 197 in the year 2018. The week of November 22nd 2018 through November 28th 2018 there has been about 5 violent crimes, 23 property crimes, and about 840 crimes total by means of 10,000 people in Exposition Park. In 2017 there was a massive gang arrest in Exposition Park. Arrested for federal charges, around 44 gang suspects were retained for murder and racketeering, which means false or crooked business dealings. ^ Charles P. Hobbs (2014). Hidden History of Transportation in Los Angeles. The History Press. ISBN 9781626196711. ^ a b c "Exposition Park". Mapping L.A. Retrieved 2018-12-08. ^ "Exposition Park | Visit USC". visit.usc.edu. Retrieved 2018-12-08. ^ "Crime Rates in Los Angeles County, California". www.laalmanac.com. Retrieved 2018-12-08. ^ "Violent Crime Ranking - Mapping L.A. - Los Angeles Times". maps.latimes.com. Retrieved 2018-12-08. ^ Branson-Potts, Richard Winton, Hailey. "Early morning raids end in arrests of nearly two dozen MS-13 gang suspects". latimes.com. Retrieved 2018-12-08. Wikimedia Commons has media related to Exposition Park, Los Angeles. Official website — Exposition Park. University Park Family — an online newspaper and social network focused on the neighborhoods around USC and Exposition Park, and the surrounding areas. Leimert Park Beat — a collaborative online community focused nearby Leimert Park: "The Soul of Los Angeles and the African American cultural center of the city".